Holothuria from Cormacks, Oamaru. From a slide by Klaus D Kemp 2013. Photographed in 2013. Worlds, usually invisible to the naked eye, feature large on the walls of the Sarjeant Gallery as part of the current exhibition, Interior Worlds. Photographer, Wayne Barrar, brought the strangely beautiful, silica exoskeletons of diatoms out from under the microscope and the 3inch by 1inch glass slides on which they are arranged, for his project, The Glass Archive, that he has been working on since 2013. A selection was made for the show at the Sarjeant. Mr Barrar who is an Associate Professor at Massey University’s School of Art in Wellington will give an illustrated talk about The Glass Archive project, 7.30pm, Wednesday 18 October at Sarjeant on the Quay. While the microphotographic images of diatoms (microscopic algae) were not created specifically for the Sarjeant exhibition, Mr Barrar said there is a crossover in the idea of worlds, the link between how people see and visualise the world. The Glass Archive exhibition draws on material from around the world, including the renowned “Oamaru diatomite,” a sample of chalky material that dates back 35 million years. It was sent to England in the 19th century and probably came to the attention of diatomists and amateur microscopists following a display of geological deposits in 1886 at the Indian and Colonial Exhibition in London. The deposit caused a sensation on account of the rich diversity of siliceous (silica secreting) microfossil species it contained. More than 700 have been identified, single celled creatures that lived at a time when the climate was sub-tropical and the seas much warmer than they are today. Mr Barrar has a science (BSc in Biology) and design background. He said there is a resurgence of interest in combining art with science, a connection that occurred naturally when 19th century men of leisure examined diatoms and sometimes even arranged them using a dog’s eyelash or a pig’s whisker on glass slides for scientific and recreational purposes – “it was pre-television times”. 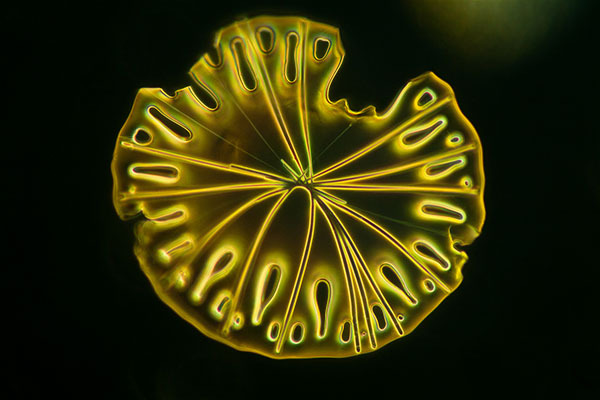 His diatom photographs feature mysterious blues, startling golds – against a black background. The colours are generated through the different types of lighting and photography techniques he uses. The stories associated with the diatomic world are plentiful and Mr Barrar’s talk is guaranteed to both entertain and inform.